Lewis Hamilton put his Mercedes on pole position for the Japanese Grand Prix as another disastrous Ferrari blunder left Sebastian Vettel only ninth. “I never in a million years thought I would get to 80 poles,” he said. “(Ferrari’s mistake) adds to the championship momentum. “It is so difficult to make the right call, but that is another real big difference that we as a team have made this year. Fast-forward three decades, and these are bleak times for Britain’s most successful Formula One team. Daniel Ricciardo’s recent bad run took another sorry twist after he was eliminated from Q2 following yet another engine failure. He will start 15th. Romain Grosjean finished fifth for Haas ahead of Toro Rosso’s Brendon Hartley. Lewis Hamilton revealed he has surprised himself by the run of “dream” drives which leave him standing on the brink of another Formula One world title. While it is too early for Hamilton’s seemingly inevitable championship coronation to take place in Japan on Sunday evening, only a meltdown by team or driver stand in the way of glory this season. Hamilton, who was comfortably fastest in both practice sessions at Suzuka on Friday, has recorded five victories from his last six outings to establish a dominant 50-point lead over Sebastian Vettel. And with a maximum of only 125 championship points on the table, it is surely a case of when, rather than if, he will engrave his name alongside Michael Schumacher and Juan Manuel Fangio as the owner of five world crowns. 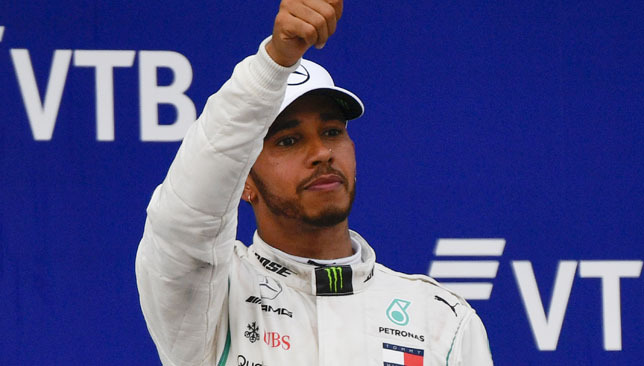 Although Hamilton had Mercedes to thank for his 70th career win in Russia last Sunday – after they controversially used team orders to usher aside Valtteri Bottas – he has been in electric form following the summer break. Hamilton, with inferior machinery, destroyed both Ferrari cars on their home patch in Monza last month to take a fine win, before he delivered one of the qualifying laps of his career at the next round in Singapore to pave the way for another victory. He was lightning fast on Friday, too. As the season reaches its climax, the Briton can now afford to score four third-place finishes and one second at the final five grands prix to secure the championship spoils. “When I look back at those recent races, I couldn’t have hoped for better performances,” Hamilton, 33, said. “There have been some dream experiences for me, performing at that level. It is what I live for. 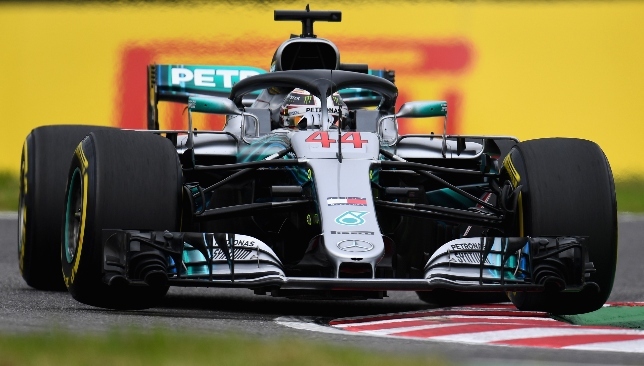 If, as expected, Hamilton takes the chequered flag here on Sunday – a race that he has won in three of the past four years – then there is a small chance that he could secure the championship in America in a fortnight. The probability, however, is that he may have to wait until Mexico a week later. Hamilton finished the best part of half-a-second faster than anybody else in practice on Friday. Bottas was second, while Vettel ended the day an uncomfortable 0.883 seconds down on his rival. Hamilton headed for Japan following a tennis date with his father, Anthony, the man who simultaneously worked multiple jobs to fund his son’s formative career, but is now somewhat on the periphery. “We didn’t really reminisce about the past,” Hamilton said. “My dad’s having tennis lessons so I said to him we should have a game. “I don’t play tennis, we are both terrible at it, and it was not very good to watch, but I beat him. “I’ll always remember when I was about six, and we would go to Blockbusters in Stevenage. Afterwards he would say ‘let’s race to the car’. My little legs couldn’t carry me fast enough, and he would never let me win. “So, the same competition happens today, and I never let him win if I can help it.” For Vettel, it is a feeling he knows all too well. Lewis Hamilton is “hungry, focused and completely determined” to secure his fifth world championship, Mercedes team principal Toto Wolff has said. Hamilton, who will head into Sunday’s Japanese Grand Prix holding a 50-point lead over Sebastian Vettel with just 125 remaining, appeared alongside Wolff at Mercedes’ headquarters in Brackley on Monday. The pair addressed the team’s workforce less than 24 hours after Hamilton’s win in Russia which edged the Brit ever closer to another title triumph. 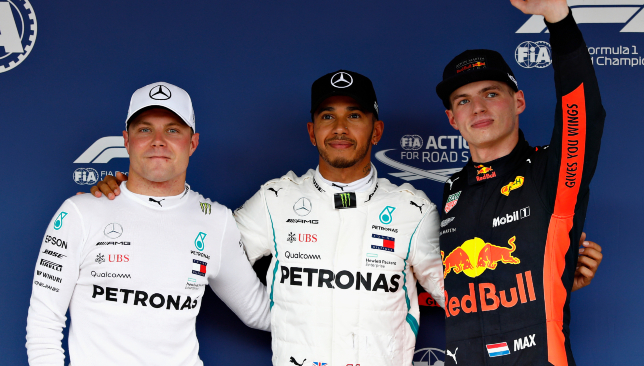 While controversy surrounded Hamilton’s victory in Sochi, after Valtteri Bottas was ordered to step aside for his Mercedes team-mate, he has won five of the last six rounds. “Lewis was in Brackley this week and is hungry, focused and completely determined to succeed,” Austrian Wolff said. Mercedes held the advantage over Ferrari in Sochi to take another step to winning an impressive fifth consecutive constructors’ championship. The Silver Arrows have not been beaten at Suzuka, the venue for this week’s race, since 2013. But Wolff added: “We left Sochi with a bigger lead in both championships, but we know that doesn’t mean anything because our fight with Ferrari is far from being over. “We can take nothing for granted and we will stay at maximum attack on every front in the next races. The battle with Ferrari remains extremely close. “Suzuka will be another challenging weekend for us. It’s a track that shows some similarities to Silverstone, where we didn’t perform as strongly this year as we had done in previous seasons.